UPCYCLED Wine Bottles are a fun and crafty way to recycle the bottles you have leftover from parties and everyday drinks. These wine bottles are elegant and a greener, more exciting alternative to throwing away glass. Considering these sell for $12 on Etsy and are utterly beautiful, why not make your own or just buy them? 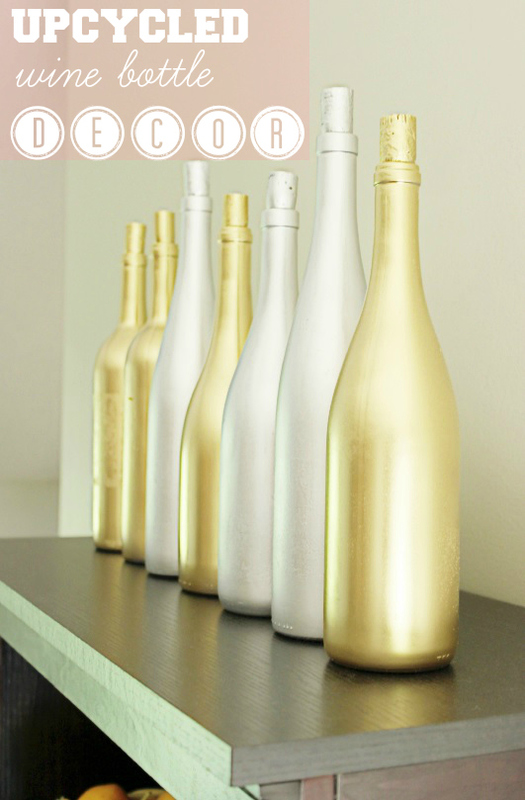 How to DIY these wine bottles? 1. Using warm soapy water, soak wine bottles until the logo wrapping comes off easily. 2. Spray paint bottles which ever color pleases you. White, Silver, Gold. 4. Print some stencils online with the words Love, Family, Health or anything that you think is in the Thanksgiving spirit. 5. Cut out the stencils and take some contrasting paint (Black, Red, Green) and paint in the words. Alternatively you can wrap and tape the printed stencil around your bottle. Wrap or cover the rest of the bottle and spray paint the words you have chosen. 6. Wait to dry. Cover bottle top with twine or a ribbon, or use it as a vase.